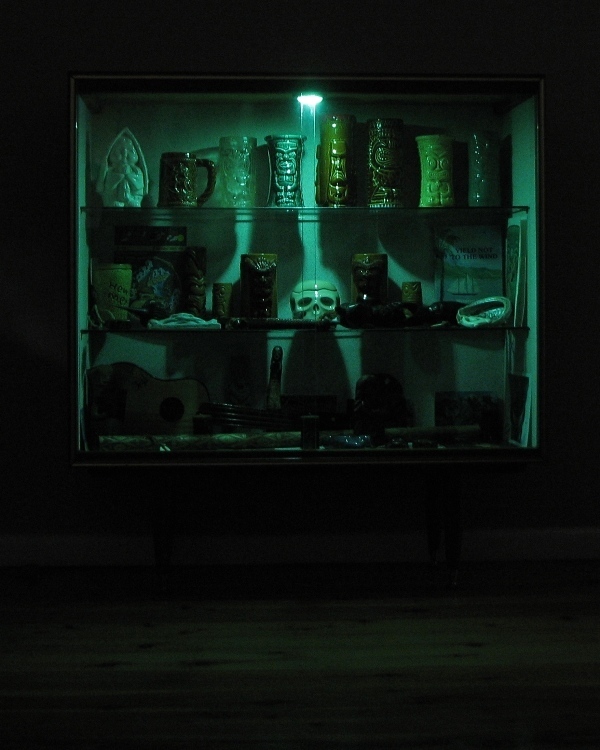 Vintage cabinets are great for showing off your collectibles. The glass fronted ones are particularly cool looking, and the bonus is that it saves a heap of dusting. 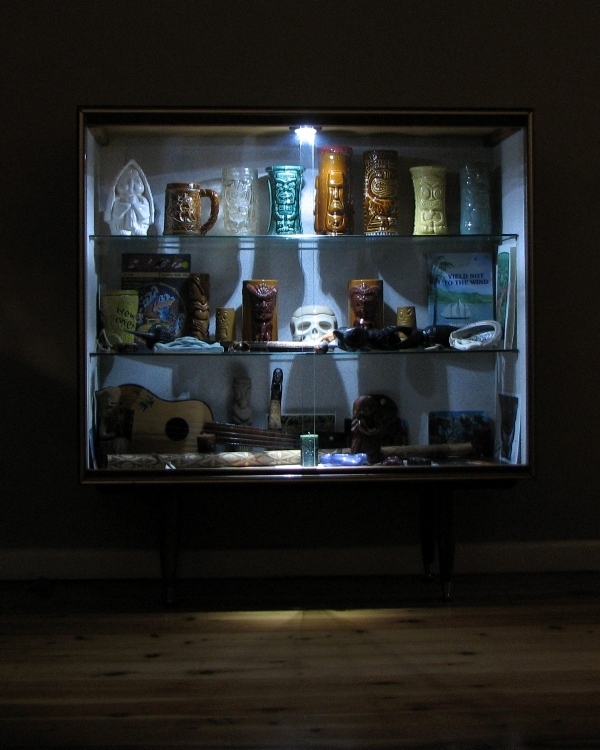 The finishing touch is down lighting to show off your collection at night, but you’d be pretty hesitant about drilling holes in an otherwise mint cabinet. 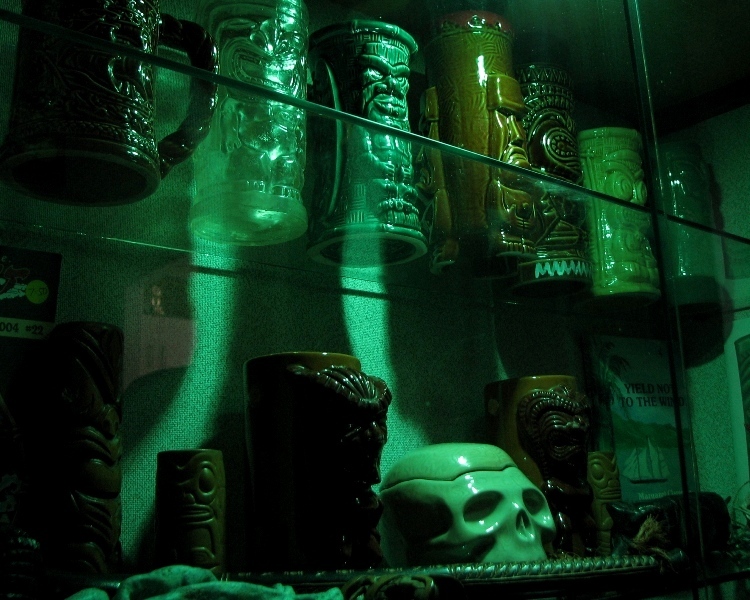 I was having this quandary with my tiki cabinet, when I came across the Dot It lights from Osram. They feature 3 LED bulbs, and kick out a reasonable amount of light. They claim 100 hours of run time from 3 triple A batteries (which are included). The other advantage of LEDs is that there is virtually no heat build up, which is great when you’re using it in an enclosed cabinet. They also come with some super sticky velcro dots, so you can attach it pretty much anywhere and it’s easy to pull out to change the batteries. To turn them on and off, just press the centre of the light. If you have a look on US ebay (where they’re sold under the brand Sylvania), you can get a set of 3 lights for US $12.00 – bargain! 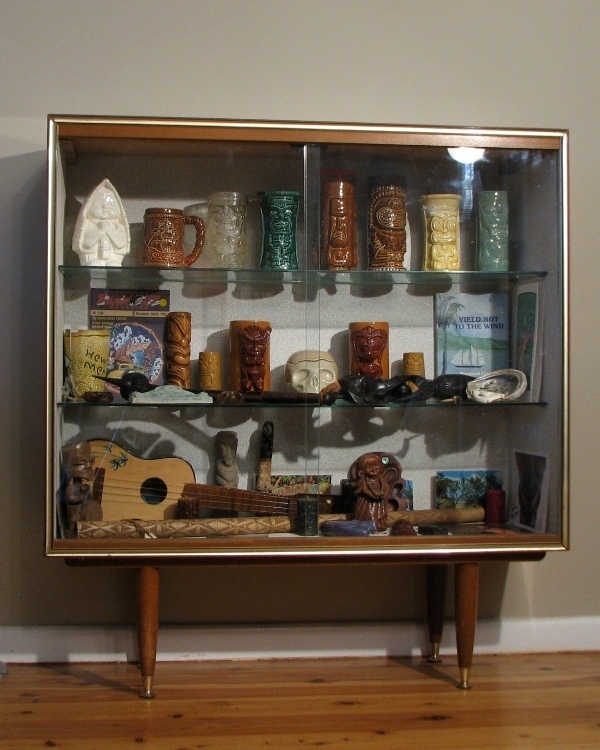 Follow along as I install one in my tiki cabinet. 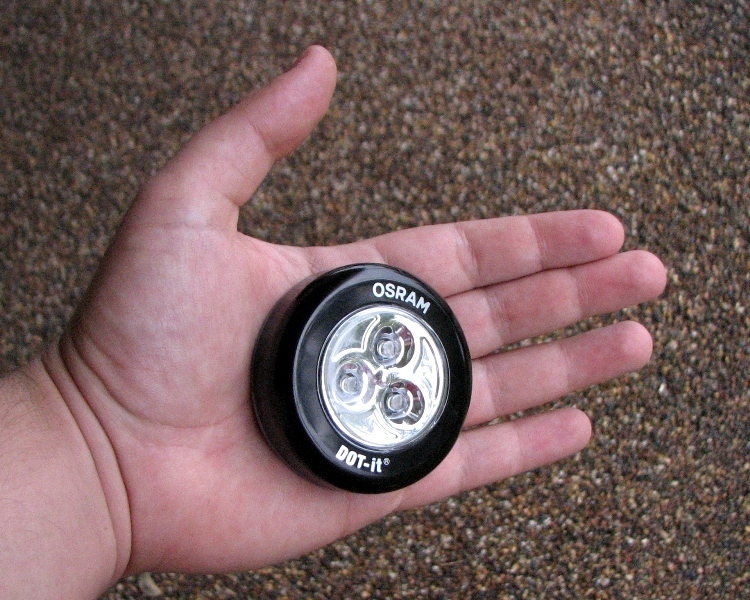 Here is the light – nice and compact, and the 3 LEDs are pretty obvious. Installation was as simple as getting the two velcro sticky dots, peeling off the backing (like a sticker), and applying one to the back of the light and the other to the ceiling of the cabinet. Once you’ve made sure they’re stuck down nicely, firmly press the light into place. That’s it! Here is what the light looks like installed and turned on. Being an LED it’s very bright and also very white, much like a fluoro. You can also see that there is a beam of focus on the bottom shelf and the floor, which doesn’t work great when you want to light multiple items. 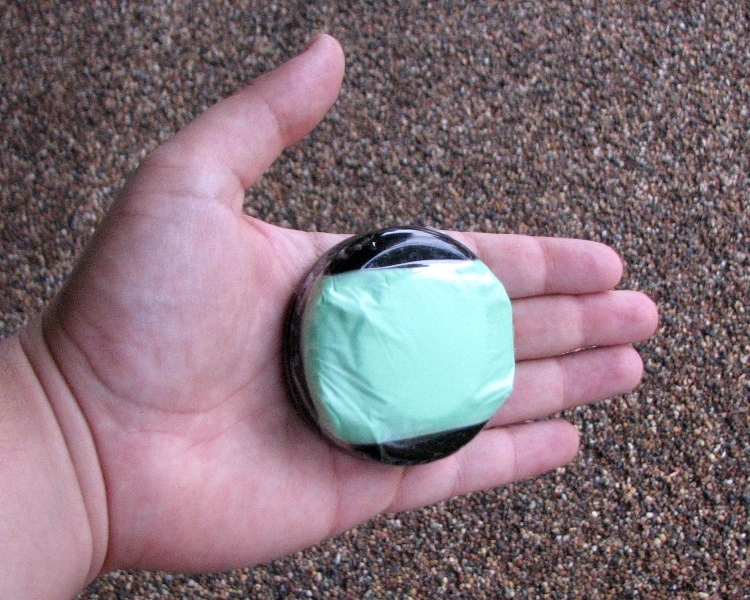 So I pulled it out, and taped a green shopping bag (doubled over a couple of times) over the LED. Extremely low tech! I also figured it would be hidden by the lip at the front of the cabinet, so it didn’t have to be pretty. Ah, how much better does that look? Not only does the green give it much better ambience, the cover also helps to diffuse the light so you don’t get that spotlight effect.